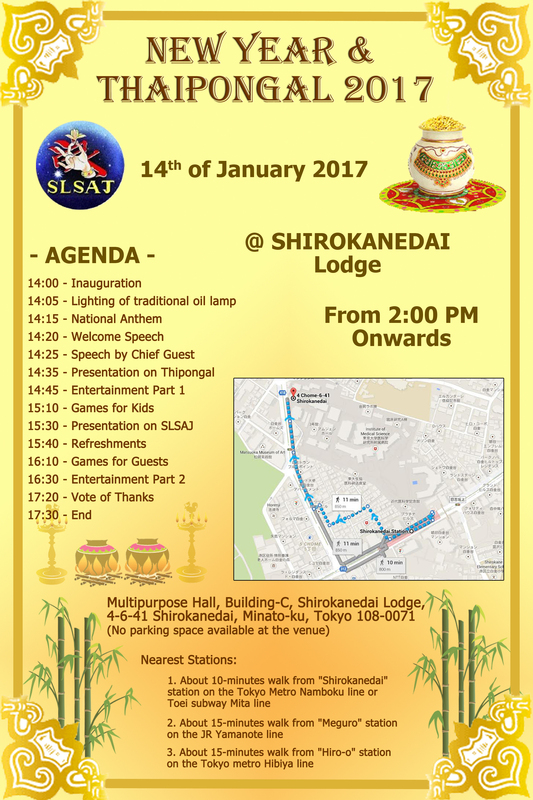 The 69th Independence Day of Sri Lanka will be held on Saturday, 4th of February 2017 at the Kotani Hall, Reiyukai,Tokyo. The embassy of Sri Lanka in Japan has invited all the SLSAJ members for the event. We warmly welcome you all to participate in this National event which will be followed by “Nidahase Sandewa” a musical evening performed by Veteran Artist Visharada Nanda Malani. මෙවරද සාර්ථකව අප විසින් ලැබුනා වූ නව වසරට ජපානයේ සිටින සියලුදෙනාටම සුබ පතා දහවල් දානය හචිඕජි පන්සලට පුජා කලෙමු. බොහෝ දෙනෙක් මෙය සාර්ථකව සිදු කර ගැනීමට උදවු වූනා. This year too SLSAJ did the annual alms-giving on January first at Hachioji Temple for wishing all the best in the coming new year to all of you. It’s time to get together and make fun in this Sinhala-Tamil new year season. As same as in the previous years, this year also “Sri Lankan New Year Festival in Japan” has been organized by Sri Lankan embassy in Japan and some other Sri Lankan organizations in Japan (including Sri Lankan Students’ Association in Japan – SLSAJ). This is one of the largest gatherings of Sri Lankan community in Japan and make sure you never miss it. You can enjoy the whole day with your family and friends while participating to the new year game events, watching cultural shows, etc. All are warmly welcome…! Venue: Chofu Sports Square, 290-4, Nishi machi, Chofu city, Tokyo 182-0032. *Prizes will be given to the winners of the game events. For further details please contact New year festival executive committee.